Go ahead and clear the next two hours. In 1980, Berkeley radio KPFA’s “Ode to Gravity” host, Charles Amirkhanian, sat down with Brian Eno to discuss the various aspects of his recording career up to that point (Eno would have just been finishing his first collaboration with David Byrne). While hour one is entertaining in and of itself, what you really don’t want to miss is the second hour. 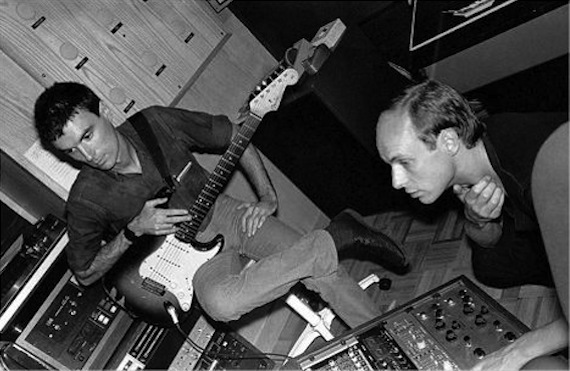 Recorded 32 years ago, Eno runs down a sort of linear history of the use the recording studio as a compositional tool — including various audio examples — beginning with Elvis, running up to the, then, modern era. A great conversation, it’s a fascinating listen especially in retrospect, as number of Eno’s — let’s call them ‘predictions’ — have long come to fruition over the past decade. Also interesting is the conversational turn towards the end of the interview with Eno discussing copyright, clearance, and what would soon be defined as sampling. I get part 1 lasting 25 minutes and part 2 only 9. Can someone tell me whether the clips should be longer? Listening to Reel 2. Extremely Ipod-worthy. What an amazingly articulate character. Well-chosen word after well-chosen word with no stumbles whatsoever.